As we look forward to a new year of working hard for global health equity, we're taking a moment to share our top five news stories of 2018. These articles highlight the Alliance's work over the past 12 months and provide a snapshot of our efforts to unleash the full range of scientific, analytic, and creative capabilities to resolve the most complex global health equity challenges of our time. The Alliance for a Healthier World awarded six planning grants worth up to USD$25,000 each during the second cycle of Healthier World Challenge Planning Grants. The successful research proposals were received from multidisciplinary teams representing faculty, staff, and students at Bloomberg School of Public Health, Carey Business School, Krieger School of Arts & Sciences, Peabody Institute, School of Education, School of Medicine, School of Nursing, and Whiting School of Engineering. Read the full story here. Alliance for a Healthier World Steering Committee member and Johns Hopkins School of Nursing professor Dr. Nancy Glass led a collaborative team to develop myPlan, a free app and online tool survivors can use to evaluate the health and safety of a relationship and connect to resources from their computer or phone. Read the full story here. In the mid twentieth century, newly independent countries were emerging, and along with new governments also came the need for new infrastructure, including health care. Enter the Alma-Ata Declaration. Read the full story here. The Alliance and the Center for Health Equity hosted a two-day Global to Local Design Thinking workshop in October that brought together more than 30 public-health experts and advocates from across Johns Hopkins University as well as from Makerere University-Johns Hopkins University (MUJHU); Baylor College of Medicine in Uganda; Moi University; the AMPATH program in Kenya; Sisters Together and Reaching, a Baltimore-based AIDS-focused nonprofit, and more. Read the full story here. 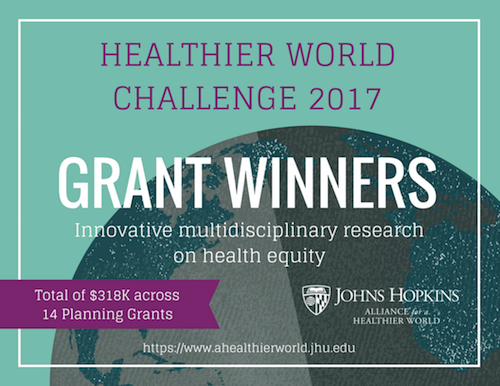 The Alliance has advanced its efforts to boost global health equity with the awarding of four $250,000 grants this fall to JHU initiatives that address critical areas of global health equity. The $1 million investment supports cross-divisional teams at Johns Hopkins University representing biomedical, engineering, education, arts and sciences, and business divisions across the campus to advance their proposed transformative contributions. Read the full story here. If you haven’t already, we encourage you to sign up for our Health Equity Connector, a monthly roundup of health equity news from the Alliance and others around the world. Stay connected and see what’s in store for 2019!